Malta Shipyards Ltd was owned by the Government of Malta. 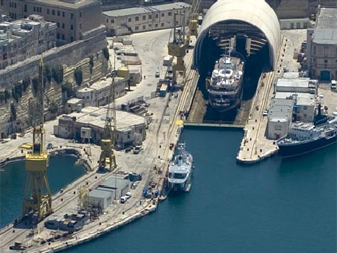 The Shipyards group employed a total of 1700 people and comprised a modern new building and steel fabrication production facility at Marsa, one of the largest dry docking repair and conversion facilities in the Mediterranean at Cospicua, a dedicated super yacht refit and repair centre – Malta Super Yacht Services, Manoel Island Yacht Yard for small boat and yacht repairs and the Malta Shipyards Tank Cleaning Station. The Malta Shipyards underwent a restructuring process, which began in 2001. This process lead to a better business, more effective in key markets of the offshore, conversions, super yacht and the commercial ship repair sectors, and most importantly, to being passed over to the Palumbo group who surely needs no introduction in this sector. In line with its then corporate plan to introduce key business streams, Malta Shipyards had created a dedicated section of the business, Malta Super Yacht Services, to focus and serve the super yacht sector. Malta Shipyards had been developing the potential of the yachting sector since 1998 when it started to enhance and maximise the potential of its primary yachting facility – Manoel Island Yacht Yard. Five years later, the investment in Malta Super Yacht Services opened the door to a new, larger and a better yacht repairing facility which ensured a firm placing in the high-end of the international yacht repair market. The dedicated facility has 800 square metres of alongside workshops, stores and offices while a large storage area houses a number of containers and site offices for use by customers. The docks are served with dockside cranes with a lifting capacity of 20 tons while a 12 ton mobile crane, a forklift and eight scissor lifts provide the rest of the handling and access requirements. In turn five hundred metres of quay are available for alongside afloat repairs. All berths are served with shore power, fire main, compressed air, telephone land lines and wireless internet connections. The unique resources of a skilled team offer a broad service package including high quality engineering repairs and installation, structural modifications and repairs in steel, composites and aluminium, several surface preparation techniques, undercover spray painting, teak decking and traditional joinery. Every yacht that comes in for repairs is allocated a project manager who ensures a smooth, timely and efficient delivery of the work scope. Experienced naval architects are available to assist in all classification or international regulation requirements, while an array of local and international specialist subcontractors are available to enhance in-house services. Throughout its operation Malta Super Yacht Services had done a thorough selection process to select and approve a number of local and international specialised subcontractors which could work to its safety and quality standards and enhance and broaden its capabilities. Today, the yard is part of the Palumbo Group which has facilities in Naples, Messina and Malta. The Palumbo Group is an international enterprise with vast shipping experience in conversion, docking & repairs, refitting and new building dating back to 1967. Due to recent company internationalization, the Group has extended its services to Malta, and aided by the acquisition of the Super Yacht Facility in Malta last March, they are now able to engage in refitting, maintenance and repairs of Super Yachts right in the middle of the Mediterranean. The company's strategic new management focuses on flexibility and optimization of working procedures to ensure product quality and on time delivery while investment in the already skilled workforce has proved successful. Since its commencement of its operation, Palumbo Superyachts has carried out works on 33 Super yachts. Palumbo Malta Superyachts covers an area of 45.000msqr, including two dry docks having the size of 170m long with 25m wide, and 140m long with 18m wide including a 30m-high paint retractable shed extending 130mt. There are also 300mt of berths where repairs can also be carried out. Docks and quays are served with rail mounted cranes with a maximum lifting capacity of 50 tons. The Yard offers a full range of services such as engineering repairs and maintenance, structural works, surface preparation and mill treatment, carpentry, outfitting, custom stainless steel fixtures and fittings and many others. NEW EXCITING DEVELOPMENTS FOR YACHT, OWNER AND CAPTAIN! By September 2011, Palumbo Malta Superyachts will offer a range of services including a showroom displaying some of the best yachting products, and also its refit and repair services including amongst others, engine overhaul, furnishing and woodworks for an extensive range of yachts including the fiberglass smaller boats. In fact, the Yacht Yard is planning to have a separate open air area for smaller yachts, ranging between 18m to 48m with a maximum 300 DWT. This area will have a slipway and will be equipped with a syncrolift and a Self Propelled Modular Transporter (SPMT) able to transport Yachts up to 300DWT. Moreover, a renovated building close to the yard will be utilized as an ideal protective shed for painting works, storage for the winter season and other possible uses required. Moreover, new exciting developments are at design stage where an old Smithery building will be renovated into a complex for Captains and crew including duplex apartments with magnificent harbor views, fully equipped gymnasium, self service kitchenette and dining area, bar, Captains office including wifi connections, and a relaxing and socializing area including lounge area, TV room and two open air large terraces. A helipad will also be developed to add to the enjoyment, comfort and accessibility of the yard! Palumbo Malta Superyachts is proud that many of the world's most famous and largest super yachts have already used its services, are satisfied and are willing to return. These Superyachts utilised the yard's services both before Palumbo took over, and also afterwards. They are all quite happy with the level of service given.